The Kingston Public Market is full of vendors selling the highest quality local produce, prepared foods, garden plants and flowers, and handmade crafts. On a typical market day in the summer you can find a huge variety of goods such as beautiful heirloom tomatoes that were left to ripen on the vine and just picked that morning, delicious homemade cinnamon buns still warm from the oven or a one-of-a-kind handmade jewelry pieces made with stones from the Kingston area. Whatever you came for, you will leave with a smile on your face and the feeling of satisfaction that comes from buying food and goods from the people who produce them. 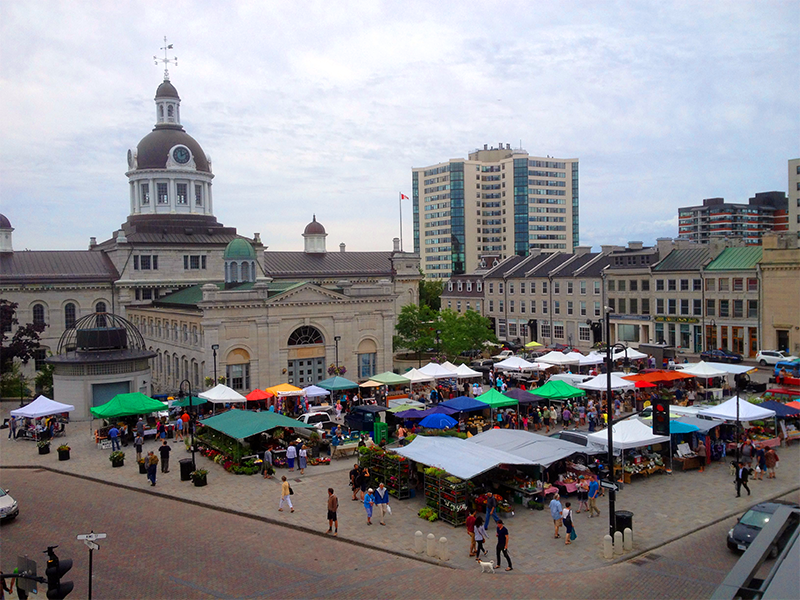 The Kingston Public Market is the oldest market in Ontario. 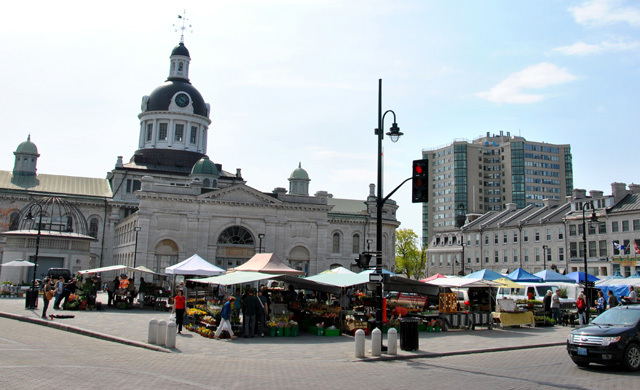 Since its official founding in 1801, the market has operated as community gathering place and has played an integral role in Kingston and our country’s history. An informal market was established on the same site in 1788 that the market now operates on today. As the Kingston population grew in the late 18th century, the market acted as the center of the local economy and community. It was the Kingston Market Square that Lieutenant – Governor Sir John Graves Simcoe chose as the location to proclaim the Constitutional Act which established Upper Canada as a separate jurisdiction on July 8, 1792. In 1801 the Kingston Public Market was granted official status by the city of Kingston. By that time Kingston was home to 1,000 people and with the establishment of the British garrison, naval base and dockyard, demand for products was on the rise. 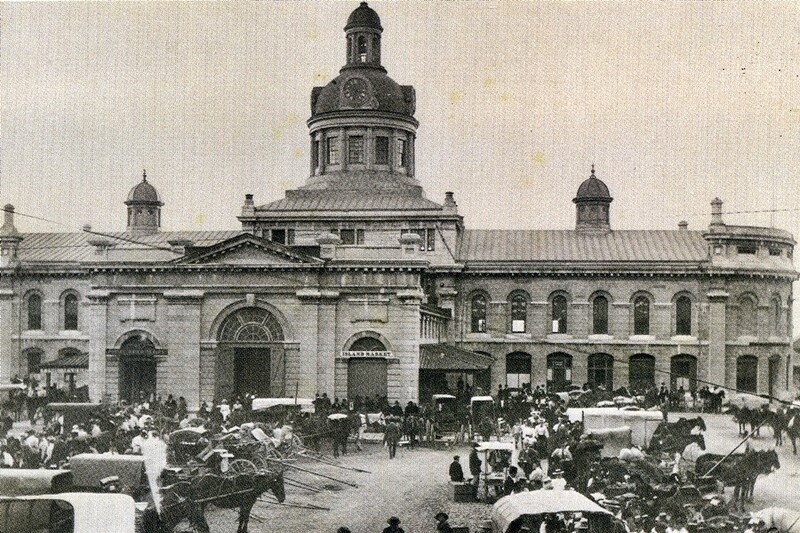 The market was the economic and social heart of Kingston – with no stores in operation, the market was the place where anyone looking to buy, sell or trade goods came to do business. On a typical day at the market, you could find venison or game birds from a local hunter, fish caught by local fishermen, wood to heat your home, hay for your livestock, wool to make clothes and iron nails to build your house. By the mid-19th century, Kingston had grown to 6,000 residents, and the market had grown with it to meet the increased demand. New businesses and buildings now surrounded the market including a city hall, hotels and merchant shops. Most of the market space was occupied by poorly constructed wooden stalls, referred to as the market shambles. The Great Fire of 1840 destroyed not only the market shambles but most of the buildings surrounding it, including the city hall. This gave rise to the reconstruction of the downtown core known as the ‘limestone revolution’. Many of the buildings that you see today were constructed during this time. July 1, 1867 – Canada is born! 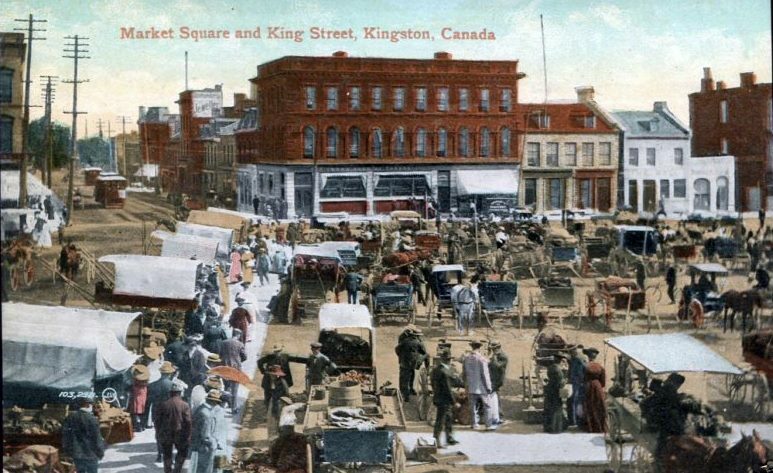 It was in Kingston Market Square that the proclamation of Confederation and the formation of the Dominion of Canada occurred. During the mid-1900’s, activity at the Kingston market slowed down as more space was needed to accommodate bigger roads, grocery stores won over consumers, and health regulations created stumbling blocks for vendors. Market space shrunk and Kingston Market Square was converted to a parking lot on non-market days. After years of struggle to maintain its place in the community, the market survived – largely thanks to the commitment of Kingston Public Market vendors and customers. In 2008, Kingston Public Market – now the Springer Market Square – was given a new lease on life with a total renovation, once again bringing to life the center of commerce, community, and history in Kingston.